Pollution in India is high as compared to other nations and is a serious concern for the environmentalists in the country. Pollution directly affects the health of people, leads to resource reduction and has dangerous consequences on the fiscal growth of the country. Rapid Industrialization and urbanization has resulted in intense weakening of environmental condition of India. It has been observed that polluted environment affect the daily life of some people in India because they do not have access to clean water, air and sanitation. Environment security is of high priority of nations like India because people are not aware of consequences of pollution. 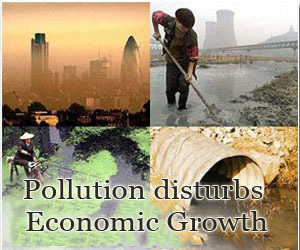 Pollution is steadily increasing and having adverse effect on the people’s life. If pollution level is too high, climatic condition changes and natural disasters are surely to be frequent phenomena. There is a need to launch awareness campaign to educate people about pollution reduction to secure the future generation in the country. In today’s situation, it is essential to formulate effective policies that can control pollution and improve the general environment. Pollution can be reduced through implementing various policies such as regulatory and market based economic instruments. Regulatory instruments stipulate emission standards or waste matter limits. These require substantial information and administrative costs to implement and monitoring of project. Market based instruments comprise of taxes, subsidies, and trading instruments etc. As compared to regulatory policies, market based instruments are more effective in controlling the costs of environmental safeguard through incentives. Government is also planning to execute effective financial policies that support measures for energy preservation, renewable energy, soil conservation, forestation and affordable access to clean water to the public etc. Numerous experts recognized the benefit of Green growth strategies to support sustainable growth and lessen the impact of environmental degradation and exhaustion of natural resources. Emission reductions can be accomplished through minimal cost to GDP. It is an established fact that if pollution in India is not controlled, then it may have adverse impact on the growth of our economy.